England, 1525. Allegiances are divided. Henry VIII wants to divorce his devoted wife Catherine of Aragon and marry Anne Boleyn. For eleven-year-old Elinor Valjean, who lives in the royal court, the conflict is about to become a personal one. She loves Queen Catherine, but now she will be forced to wait upon her supplanter… Elinor’s diary chronicles the turbulent years of Henry’s divorce from Catherine, and her role as bystander to one of history’s stormiest marriages. I liked this book, it went into great detail. 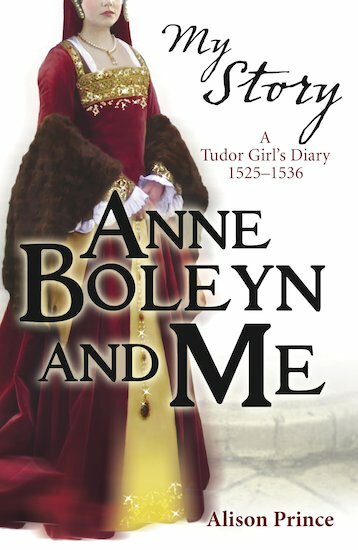 And although at the start Anne Boleyn seems like a bad person, you end up feeling so sorry for her! The only thing I don’t like about this book is that it seems to be the same kind of ‘plot’ as the book before it and the one after it. The main character gets married, has 1+ children….etc, but that’s only my opinion! it is a totally awesome book a girl who is a lady in waiting to queen Catherine then Henry VIII wants to divorce Catherine and marry Anne Boleyn who later is beheaded. Gave an interesting insight to the tudors. I have just finished this book as I have been reading it over the summer holidays because I am starting my new school in September named Antrim grammar school I live in Northern Ireland and you have to read a minimum of two books but I am going to read more my other book at the minute is war horse I have finished Anne Boleyn and me in 3 days I absolutely loved it! it has got me interested in history and I thought I wouldn’t like it but I would recommend this to anyone! This time in history is really exciting and definitely worth reading about. The book really brings to life what happened. This book starts when Elinor is 11 and it ends when she is 23. This book documents her growing up in a place where is you don’t watch your tong you loose your head! At 11 the court is a happy place for such a lively girl, but as she matures the court changes and she begins to realize what a sinister place it can be. As people she once knew start to loose their lives, she leans that Tudor courts are places of plots, death, fear and deception.